The 1,882 acre state park features the Lewis & Clark Interpretive Center. The Center’s interactive exhibits, trails and park ranger programs commemorate the national significance of the linking of America from the Atlantic to the Pacific. From the interpretive center, enjoy panoramic views of the Pacific, the Columbia River, and the Cape Disappointment Lighthouse. Nearby North Head Lighthouse also offers breathtaking views of the Pacific and the expansive beach extending 20-plus miles north. This state park offers yurts, cabins, unique vacation homes as well as campsites and group camp accommodations. 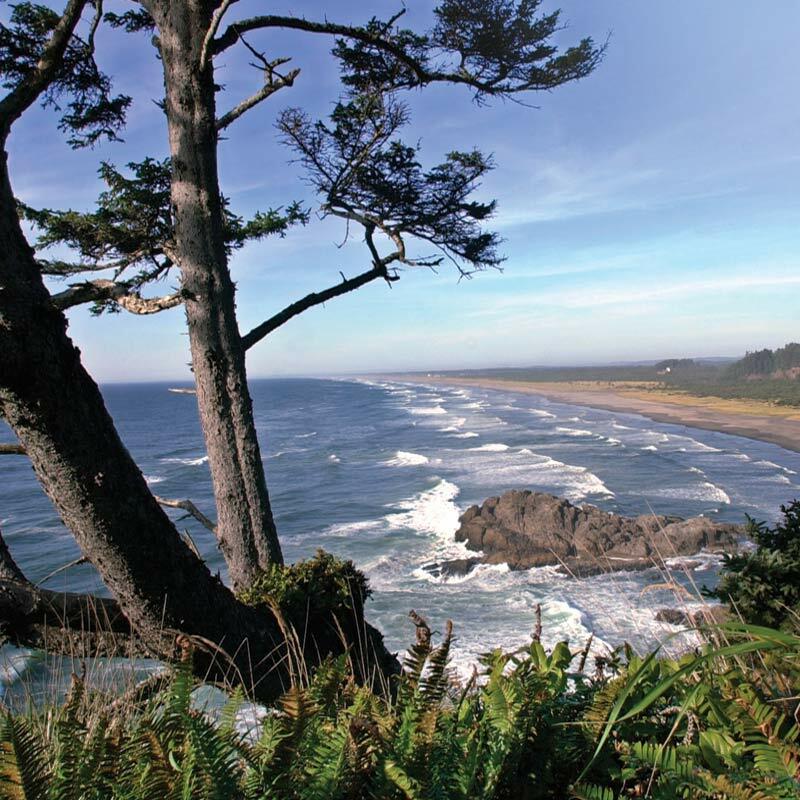 You’ll see old growth temperate rain forests, salt water marshes, and coastal tidelands in addition to dramatic viewscapes of the Pacific Ocean and the mouth of the Columbia River. Visitors can launch their boats at Bakers Bay, dig for clams at Benson Beach, and catch salmon and crab off North Jetty. 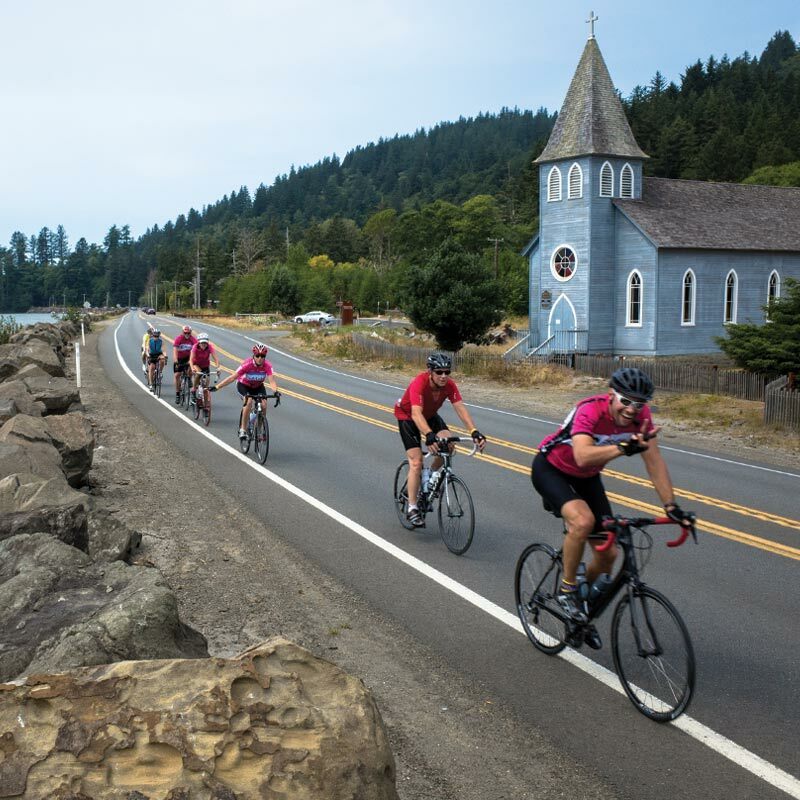 Ride a bike, walk, or run the 8.5-mile Discovery Trail from Ilwaco over the Cape Disappointment headlands to Beards Hollow and through the dunes to Long Beach. Along the Columbia, explore the Meglar Rest Area (Dismal Nitch) near the Astoria-Megler Bridge where in 1805 the Corps, realizing they could go no further westward in their dugout canoes, moved from Dismal Nitch to the more sheltered summer residence of the Chinook Indians. near Chinook. Once rested, Clark led a party of men over the Cape Disappointment headlands and up the beach to a mile north of present day Long Beach where they celebrated their arrival at the Pacific Ocean. Clark carved on a tree the inscription, “William Clark, Nov. 19, 1805. By land from the U. States”. you’ll see where coastal guns protected the bay during World War II and earlier wars. There are 6,400 feet of scenic freshwater shoreline at this popular historic attraction. is one of the Pacific Coast’s most enjoyed vacation destinations. William Clark explored its sandy beaches in 1805. 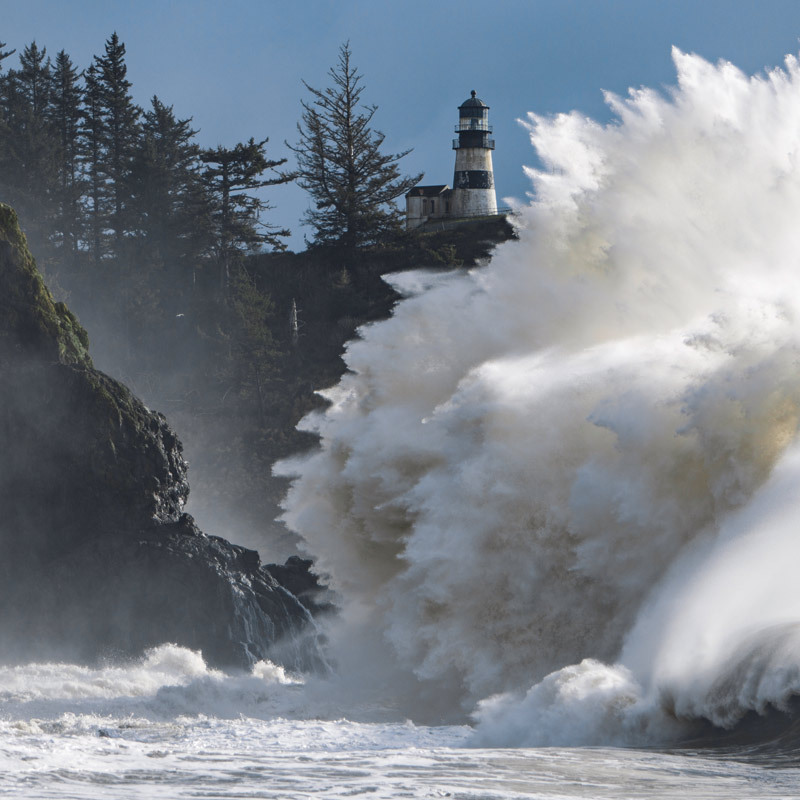 Five state parks including Cape Disappointment, Fort Columbia, Loomis Lake, Pacific Pines and Leadbetter Point are focal points for a variety of fun, year-round activities. From the fishing village of Ilwaco you can head north to explore other unique, coastal communities including Seaview and its Victorian-era architecture, festive Long Beach with kite shops, horseback riding, ice cream stands and more, serene Klipsan Beach, and the peaceful village of Ocean Park, then continue north on the Willapa Bay Side of the Peninsula to Nahcotta, Oysterville and Leadbetter Point State Park for great bird watching. Friendly volunteers at the Long Beach Peninsula Visitors Center at the junction of SR 103 and US 101 in Seaview can point out outstanding restaurants, fresh seafood markets and other points of interest. Discovery Awaits! Walk along the Willapa Interpretive Trail and see Long Island, home to an ancient grove of red cedars. The home of the Pacific County Courthouse, know for its magnificent art glass dome. Raymond, at the mouth of the Willapa River, greets visitors with 200 life-sized steel statues of people and wildlife along US 101 and downtown. The Northwest Carriage Museum is also here. The 5-mile Willapa River Trail connects Raymond and South Bend. North of Raymond, take SR 105 west to Grayland Beach State Park for the beach loop campground trails that lead to grassy dunes, wind-bent shore pines and the Pacific. Continuing north is Twin Harbors State Park and its classic Washington State Park coastal vacation experience. This fishing village is home to The Maritime Museum. Explore the Westport Lighthouse at the Westport Light State Park. 8. 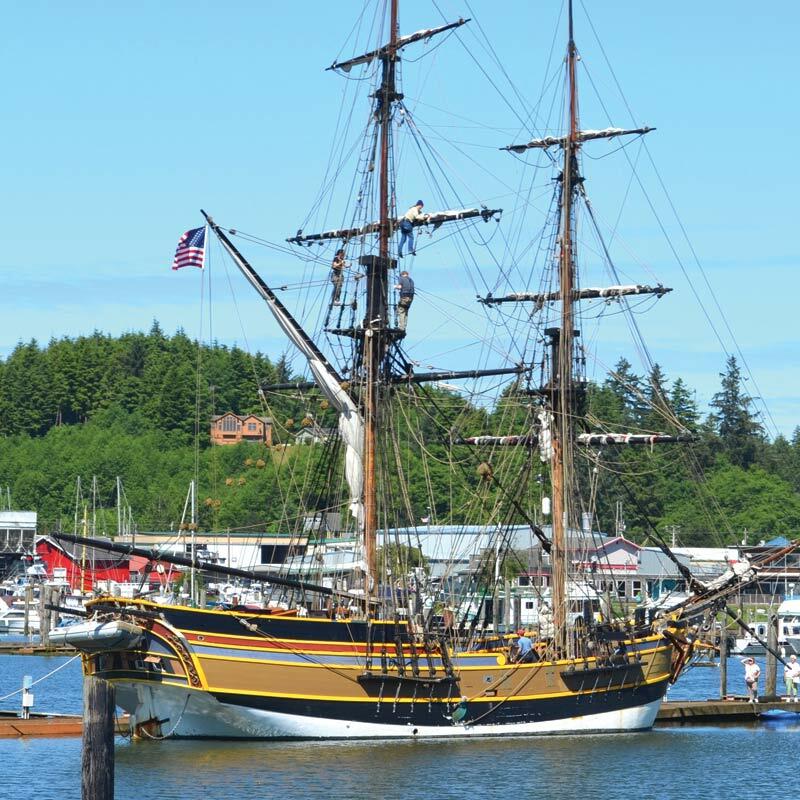 Grays Harbor Historical Seaport in Aberdeen. Step aboard Washington’s tall ships the Hawaiian Chieftain and the Lady Washington. At Hoquiam you can explore the Grays Harbor National Wildlife Refuge. A 170-acre camping park with ocean beach, dunes and shore pine. Located in a former logging camp above the historic town of Montesano. A large swimming and fishing lake draws families here, and the old logging roads are now bike trails offering a great way to get out and experience nature. Up the road is Elma, gateway to Grays Harbor. Take US 12 south along the Chehalis River to Grand Mound, home of the Great Wolf Lodge and Water Park. Here you’ll find the Centralia Rollerdome, the Centralia Factory Outlets, and the Historic Downtown District. You can access the Eastern trailhead of the scenic 56-mile Willapa Hills State Park Trail in Chehalis. It’s a great gravel trail experience for hikers, joggers. The Chehalis-Centralia Railroad & Museum is also located in Chehalis. Offers camping in the heart of an old-growth forest and a rainbow-crowned waterfall. The Matilda Jackson State Park Heritage Site, a wonderful day-use park is also near Chehalis. offers hiking and horseback riding through a stand of old-growth trees on the historic north spur of the Oregon Trail. at Silver Lake, less than 10 minutes from I-5. They are great places to learn about the historic Mount St. Helens volcanic eruption. Seaquest State Park connects to the Visitor Center by way of a pedestrian tunnel. Hiking and biking trails abound at the park which also offers camping and overnight accommodations. Take the Spirit Lake Memorial Highway (SR 504) east to the Mount St. Helens National Volcanic Monument and the Spirit Lake recreation areas. Castle Rock features an historic downtown with shops, antique stores and restaurants. 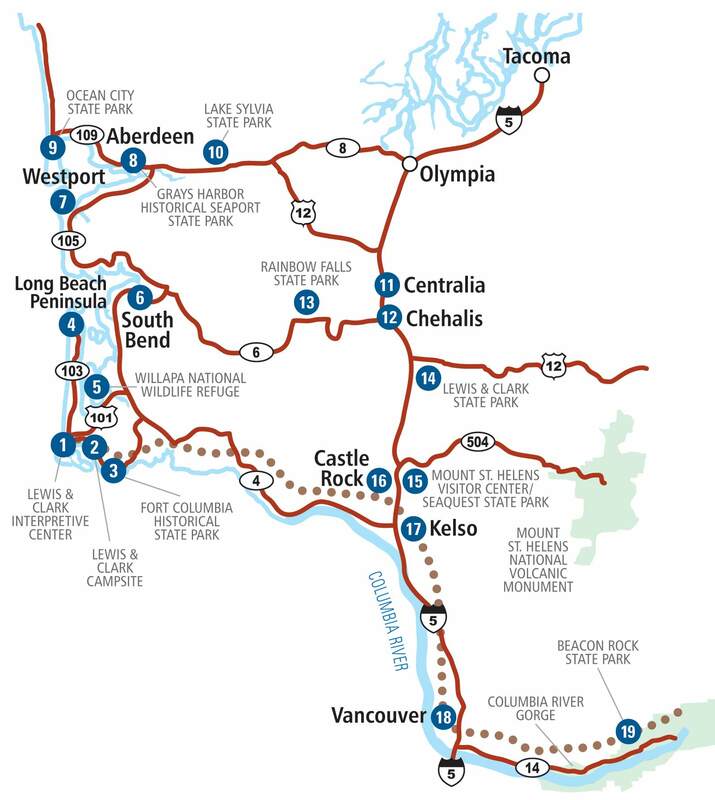 take SR 4 and the Lewis & Clark Trail Scenic Byway west to the ocean as you parallel the Columbia River to its junction with the Pacific. Along the way you’ll see Longview and its famous Nutty Narrows squirrel bridge, Cathlamet and its art gallery and shops, and picturesque Skamokawa. At Kelso, you can visit the Cowlitz County Museum featuring a Toutle River pioneer cabin and historic Native American artifacts. At Vancouver you will experience Fort Vancouver National Historic Site, headquarters for the British Hudson’s Bay Company. Today, visitors can go parasailing on the Columbia, stroll along the scenic waterfront with its large outdoor sculptures and promenade on the grounds of historic Fort Vancouver. Just east of Vancouver is the Columbia River Gorge, one of America’s great natural wonders. East of Vancouver on SR 14 is Camas and its tree-lined downtown accented with 1890s streetlamps, bronze sculptures, and boutiques. Continuing east, Washougal is home to the Pendleton Woolen Mills. is further east on SR 14. It is one of the most spectacular sites on the Lewis and Clark Trail. The huge rock is actually the core of an ancient volcano. The park offers hiking, rock climbing, horseback riding, interpretive trails and markers, camping, boating, and a trail to the top of Beacon Rock.